Best grown in full sun, Zinnias are a very colourful perennial, brilliant flowers right though summer. 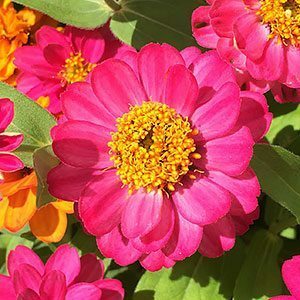 For a splash of color in summer, Zinnia varieties are a wonderful flowering plant that require a warm soil to thrive. They can be grown from seed sown directly once the soil warms up, in cooler areas this is once summer has commenced and the danger of cold wet periods is over. Grown as an annual Zinnias flower throughout summer well into spring, they attract butterflies and birds and make an excellent cut flower. Some strains will reach around 1m in height. And yes you can grow zinnias in a pot or container, just select a largish pot and a good potting soil. You can get ‘Dahlia Flowering’, and ‘Cactus Flowering’ types but look for the unusual, Zinnia elegans ‘Benary’s Giant Lime’, large lime green flowers, attractive foliage and a great cut flower. Zinnia haageana are a dwarf or low growing variety often sold as ‘Persian Carpet’, however some Zinnia elegans hybrids are also dwarf growing. The first secret to growing Zinnias is warmth, the second is a frost free environment. Given these conditions they are easy to grow, and can even be regarded as drought tolerant. Full sun and a humus rich well drained soil is essential. 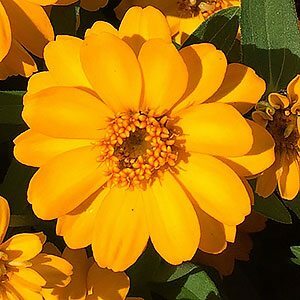 Do not plant Zinnias into the open until at least late spring. You can buy seedlings from good nurseries or you can sow seeds which are easily started in a covered seedling tray. Seeds can be sown direct in late spring to mid summer. Seeds sown indoors can be sown mid spring and planted out once the weather is warmer. Seeds should be sown around 1cm deep in a fine soil, water in well with a seaweed fertilizer and keep moist until established. Keep seedlings moist but not wet. Deadhead to promote a second flush of flowers. Generally sowing to early is a major problem, Zinnias do not like the cold, and although plants are available in punnets as early as September, in cooler areas wait until late October to November. Over watering and poor air flow and not enough sun are the other major problems, these lead to mildew.